The temps have dropped here in Florida and I'm finally getting around to pulling out the sweaters. My favorite time of the year is finally here! It's only Monday, and I'm already ready for the weekend.... Who's with me? this jacket caught my eye on your insta, but I didn't see the fringe!! love it. SO I kinda need this outfit in my closet right now!!! The jacket is amazing and the fringe is gorgeous!!! great color! love how its different then just the traditional black or brown leather! This is such a cute dress! 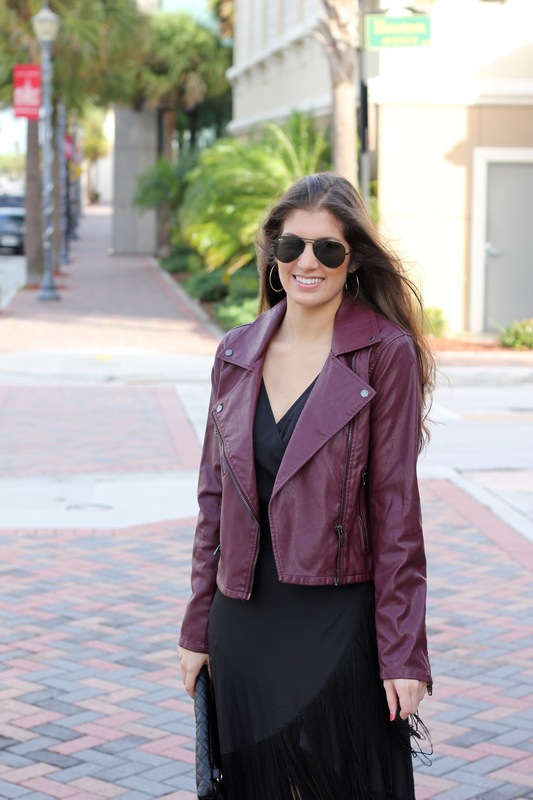 This oxblood jacket is the perfect color to go with black. That dress is so pretty! I love the fringe! I'm not big on fringe, but then again I don't recall ever seeing it in black. I love the dress and want one for myself. I was totally not expecting that fringe bottom!! How fun! OMG yes! I LLLLLOOOVE this look! So fabulous! That dress is perfection! I have a very similar jacket in the same color! Who knew that a moto jacket can go with mostly anything and everything! LOVE! I'm absolutely obsessed with fringe and really love how you paired that fabulous jacket with it! Looking gorgeous! This is such a fun and flirty dress! Love the touch of edge that the leather jacket brings.